TREPKO Group took part in the world’s biggest and most important event in manufacturing, filling and packaging of all types of beverages and liquid foodstuffs – DRINKTEC 2017. Trepko would like to extend a big Thank you to all our visitors! The TREPKO Group were amongst a record 4,865 exhibitors during the 2017 Interpack exhibition in Dusseldorf. 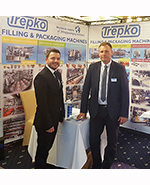 Trepko showcased many new solutions from single machines to complete and comprehensive packing lines in an exhibition area of more than 400M2. TREPKO became the only machine producer around the World who can provide complete turn-key solutions for all aspects relating to the packaging profession. 85% of TREPKO’s booth was dedicated to demonstrate 26 packaging equipment solutions to discover the future of packaging industry with an ONE – STOP SHOP philosophy. The International Food Tech Fair was held in Denmark between the 1st and 3rd November, 2016. Once again, TREPKO were amongst the 290 exhibitors from all over the world. The TREPKO stand was divided into two parts: the demo area for practical operation of packaging lines and an exhibition area for individual solutions. TREPKO were amongst the 721 companies from 33 countries across Europe, Asia and America who exhibited at the 21st edition of the Agroprodmash Fair 2016 which was held in Moscow. During the fair, state-of-the-art equipment solutions and technological innovations for various food industry sectors were presented in 19 thematic showrooms. The FachPack Trade Fair was an excellent opportunity to establish new business contacts and exchange new technological ideas. This Trade Fair allowed a large group of exhibitors from the packaging, technology and logistics industries to meet together. TREPKO are making intensive preparations for several Fairs that are being held between September and November 2016. Following developments within the TREPKO Group and consequently, a dynamic expansion of markets, the solutions that have appeared on our latest TREPKO portfolio are to be presented at the cyclical fairs in 2016. The autumn cycle of fairs include the following exhibitions: FachPack in Nuremberg, Agroprodmash in Moscow, FoodTech in Herning and Pack Expo in Chicago. Clients interested in non-standard and innovative packaging solutions utilising individual machines are welcome to visit our stands. We invited our quests to walk around the island we created on our 550m2 stand at Anuga to see the flood wave technology on display. Along our 100 metres of coast, customers were able to view more than 20 machines ranging from single solutions to complex packaging lines. The PPMA Show is by far the UK’s largest Processing and Packaging Machinery Exhibition with over 300 exhibitors and more than 8,000 visitors. 2014 showcased the very latest technology from processing, packaging, industrial robotics and vision sectors. Trepko UK Limited had a very positive response from both new and existing customers, generating some excellent leads for the remainder of the year and into 2015. At the exhibition we showcased a 234KSP Yoghurt Rotary Filling and Sealing Machine, a 9003 small portion Forming, Filling and Sealing Machine for butter, a 710 Wrap Around Machine for shelf ready packing of tubs and a PMG2 Butter Brick Forming and Wrapping Machine. Alongside the machines on show, we also had brochures and videos for a good proportion of our company portfolio, which ultimately allowed us to highlight our full turnkey solutions to both existing customers and new potential leads. Interpack 2014 is behind us! The very successful Interpack Trade Fair, held in Dusseldorf, Germany, finished on the 14th May, 2014. The TREPKO Group presented their latest solutions, proving that the impossible is possible, on a 500sqm stand. TREPKO recently exhibited at the 2013 PMMI Pack Expo on September 23rd – 25th at the Las Vegas Convention Center. PMMI Pack Expo is one of today’s leading packaging and processing shows in North and Latin America. 2013 marked a Pack Expo record of 27,500 attendees from virtually every market. Yamato Scale Dataweigh (UK) Ltd and Trepko (UK) Ltd will he holding a two week open house event from the 18th November, 2013 at Yamato’s headquarters in Leeds. Trepko have just participated in the PMMI Exhibition in Chicago, USA, this is the second time Trepko has taken part in this particular exhibition and have been very pleased with the response and level of enquiries received during the exhibition. The Interpack, International Trade Fair for Packaging Machinery takes place every 3 years in Dusseldorf, Germany, this is the most important and largest exhibiton for the packaging industry. From the 19th to 30th September 2010, Trepko took part at FachPack 2010 exhibition in Nuremberg (Germany). Between the 13th and 16th September 2010 Trepko exhibited their machines at the Polagra-Tech exhibition – "Devices for the Dairy Industry".